Are you or someone you know an Eat’n Park fanatic? Then you’ve come to the right place! Eat’n Park gift cards are PERFECT for any occasion. Birthdays, Holidays, Thanks You's, Graduations...you can't go wrong! You can pick them up at any Eat'n Park location, or purchase them online. Our gift cards are available online in two formats. You can have a traditional plastic gift card mailed to the address of your choice, or you can send an electronic gift card that can be printed and redeemed just like a regular gift card. Send one of our traditional plastic gift cards and it'll arrive in 5-10 business days. Email an e-gift card personalized with a message, photo, and voice and have it delivered in the same day- with no shipping costs! Traditional gift cards and e-gift cards are only redeemable at Eat'n Park restaurants, and are not valid at SmileyCookie.com. Smiley Ceramic Mugs are on clearance at all Eat’n Park locations to make room for a brand-new line of mugs in the spring! Looking for Smiley apparel or travel mugs? Those items are on clearance at select Eat’n Park locations. Stop by to pick up your favorite Smiley Stuff at discounted prices, while supplies last! Find out which locations are offering our Smiley apparel and travel mugs. Can’t get enough of our signature Smiley Cookies? Now you can order them online at www.smileycookie.com and have them shipped anywhere in the U.S.! 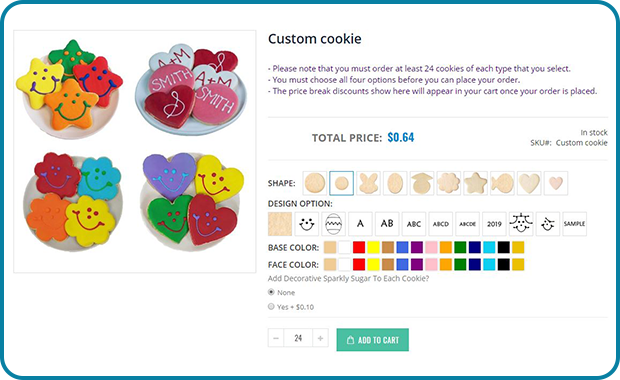 You can even create your own Smiley Cookies in the colors and shapes of your choice. At SmileyCookie.com, you’ll find the perfect gift for any occasion. From our original Smiley Cookies to customized gift packs, we have everything you need to make friends, family, and even business associates smile. And here’s something to make YOU smile. $5 off your first order of $30 or more! Just enter the coupon code Welcome5 at checkout. Excludes gift cards.